In the spring of 2018 the Fondation de l’Hermitage is turning its attention to pastels, a fascinating medium halfway between drawing and painting. 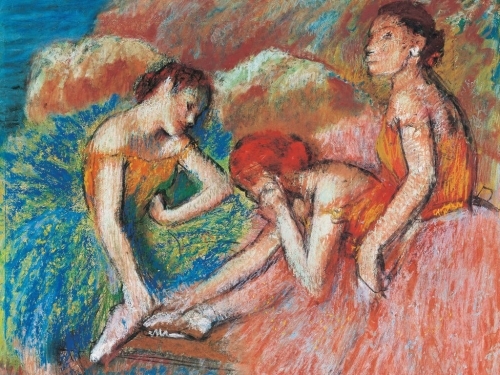 Inspired by Danseuses au repos, the famous pastel by Degas donated to the Fondation de l’Hermitage twenty years ago, this exhibition will feature 150 masterpieces from public and private collections in Switzerland. Works covering five centuries, from the early Renaissance masters to contemporary artists, will provide a historical overview of this singular technique. The visit begins with the earliest drawings retouched in pastel (Barocci, Bassano) before moving on to the golden age of portraiture in the 18thcentury (Carriera, Liotard, La Tour, Perronneau, Tiepolo), followed by a renewal of pastel techniques in 19th century landscapes (Boudin, Sisley) and the virtuosity of Impressionist figure drawing (Degas, Manet, Morisot). The turn of the 20th century saw a great vogue for the medium, illustrated here by works by the Nabis (Denis, Vuillard), society portraits (Helleu, Tissot) and the visionary explorations of Redon and the Symbolists (Khnopff, Lévy-Dhurmer, Delville). One room will focus on the vibrancy of Swiss art in the same period (Amiet, G. Giacometti, Grasset, Segantini, Steinlen). After considering the 20th-century avant gardes and their quest for abstraction and modernity (Giacometti, Kirchner, Klee, Kupka, Miró, Picasso), the exhibition will conclude with the contemporary scene (Chamberlain, Samaras, Sandback, Stämpfli, Mangold, Nemours, Szafran, Scully), culminating in a mural specially designed for the event by young Swiss artist Nicolas Party. With this entirely new selection the Fondation de l’Hermitage offers the public an exclusive opportunity to explore the splendours of pastels and the range of a medium that has lent itself to experimentation of all kinds through the combined power and grace of pure colour. The exhibition catalogue, co-produced with La Bibliothèque des Arts, will feature colour reproductions of all the works on show, and several essays written by experts on the different periods and on the pastel medium itself. Curated by Sylvie Wuhrmann, Director of the Fondation de l’Hermitage, and Aurélie Couvreur, Curator of the Fondation de l’Hermitage.